BO GRUMPUS was formed in Boston in 1967 and are not to be confused with the group using the name in the 1990s—2000s. N.D. Smart and Jim Colegrove traveled from Ohio to team up with guitarists, Eddie Mottau and Joe Hutchinson. Eddie and Joe had performed as a duo in the mid-sixties called Two Guys From Boston. They had done some recording with Noel "Paul" Stookey as their producer but had only one single released on the Scepter label. N.D. had met the Two Guys when they performed in Dayton, Ohio at the local folk club, The Lemon Tree. N.D. then both recorded and performed with them. When they asked him to join them to make a band he was prompt to say yes. N.D. asked Jim Colegrove to join them on bass. The group first performed at The Loft on Charles Street in Boston using the name The Bait Shop. It wasn’t long before Eddie and Joe called their friend Felix Pappalardi in New York to come to Boston to hear the group play. Felix had played bass with The Two Guys on their recordings. At the time, Felix had already produced The Youngbloods records for RCA and was in the midst of recording Cream for their upcoming Disraeli Gears LP. Felix came to Boston and heard the group. He and his partner, Bud Prager, liked the band and set about to secure a recording/publishing deal for them. The Bait Shop moved to New York City in June, 1967 and prepared to record. The first of many changes occurred when Felix asked the band to change their name. His suggestion was a name that his wife, Gail Collins, came up with. Gail was an artist and had a drawing that hung on their living room wall she called Bo Grumpus. It was a strange-looking creature with other equally strange-looking creatures crawling out of a hole in its stomach. Felix thought the name was so unusual that it would be defined by the style of music that the group recorded. Felix was quoted as saying, "It’s a good name that means nothing." 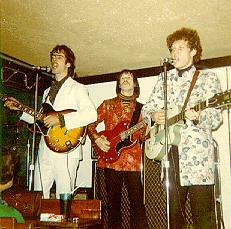 The band made its New York debut at the Gaslight Café on MacDougal Street. In the autumn of 1967 they began working at The Café Wha?. The group still hadn’t completed an LP. By the end of the year N.D. decided to leave the group to join John Hall’s band, Kangaroo. The former Hello People drummer, Ronnie Blake, replaced N.D. Music at The Wha? worked in two shifts. The bands on the night shift when Bo Grumpus started were Cat Mother and the All-Night Newsboys and the Peepl. Cat Mother went on to have a big hit with Good Old Rock and Roll on Polydor. Two of the guys in the Peepl, Joey DeJesus and Peter Alongi, went on to record with a group called Banchee on Atlantic and Polydor. Comedian David Frye appeared there that summer. Other bands that worked there during this time were the Raves, the Cherry People, the Roman Numerals, Kangaroo, the Hello People, the Turnkeys, Meat (with Rob Stoner), The Castilles (with Bruce Springsteen), Watertower West (with Alan Merrill) and Jessie’s First Carnival (with Jeff Gutcheon). In the spring of 1968, Before The War was issued on the Atco label. A couple of tracks were engineered by Chris Houston, former member of The Undertakers. Felix said that the roots to his rock group, Mountain, can be traced to this recording. When Bell Records approached Felix with an offer for him to produce a record, he wanted Bo Grumpus to be the band. The problem was, The Richmond Organization (the group’s publishing company) owned the rights to the name Bo Grumpus being used for a musical group. That meant another name change. At the suggestion of Eddie Mottau, the group changed its name to Jolliver Arkansaw. They went into the studio early in 1969 to record. On one of the tracks, Gray Afternoon, they were joined by guitarist Leslie West. The solo that Leslie played on this track convinced Felix to start a band with him. That band became known as Mountain. Jolliver Arkansaw’s LP, titled Home, was issued on Bell in 1969. Gray Afternoon has been reissued on a Sound Stories compilation CD (see below). It still gets played on cable music channels. 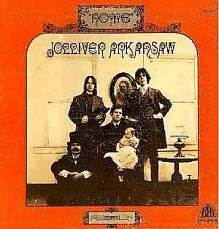 By August, 1969, Jolliver Arkansaw had come to its end and the group’s members went their separate ways. Jim Colegrove joined Ian & Sylvia’s band Great Speckled Bird and reunited with N.D. Smart. Eddie Mottau became Noel Stookey’s producer, recorded and performed with John Lennon then started his own solo career. Joe Hutchinson headed back to Pennsylvania to start a new life. In the 1970s he would reunite with Colegrove in a band called Jook. It is a strange twist of fate that in this day and age some characterize the original Bo Grumpus as “the psychedelic band from Boston” or “anti-war band” when in fact they were a ragtime group in their formative years performing tunes such as Sister Kate, Gimme A Pigfoot, The Preacher and The Bear, Big Fat Woman, Charlie Green (Trombone Charlie) and many others in that style. They were steered in another direction as is evidenced on Before The War. Additionally, the name Jolliver Arkansaw is often spelled "Arkansas" on many Web sites. This seems to indicate that the writer was not familiar with the spelling of the name or else figured the group hadn’t enough sense to spell it correctly. Of course, the name Jolliver Arkansaw did not refer to the state and, in fact, had no meaning. 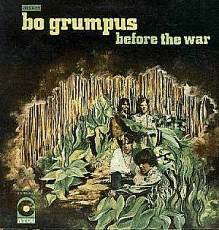 Bo Grumpus Before The War was released on CD by Wounded Bird Records in July 2008 (http://www.artist-shop.com/wounded/) wherever they might be. I wrote earlier about Boston groups, including this mention: Over on Atco, Bo Grumpus had an album regrettably overproduced by Felix Pappalardi. They were much more like a Lovin’ Spoonful in person - also a great live act, as I remember. I was questioned as to their “Boston-ness” off list, as WBCN never played them. True, their album was not up to their live act, but they were frequently at the Tea Party and the Psychedelic Supermarket, among other locations. Bassist and songwriter Jim Colegrove has a new label in Texas, by the way: Cool Groove http://www.thecoolgroove.com, which has links to Bo Grumpus and to many other artists of interest to this list who are still currently out there working! This is a latter day version of Bo Grumpus (whose album I have not heard). After the brief “heyday” of the Bosstown Sound, several fo the surviving bands took a sharp turn to what would later be called album-oriented rock (AOR). Jolliver Arkansaw, Eagle, and the Apple Pie Motherhood Band are all in this catagory. Of the three, the best is Jolliver Arkansaw, who brings sufficient finesse and texture to the form to stand out from the hundreds of bands who cranked out AOR in the late 1960s and early 1970s. Jolliver Arkansaw probably benefitted greatly from their assiciation with Leslie West and Felix Pappalardi. Several songs on the album sound similar to the work of West and Pappalardi’s later aggregation, Mountain. I came to this one working backwards along bassist Jim Colegrove’s timeline. I’d heard Colegrove’s wonderfully idiosyncratic bass playing on Bobby Charles’s eponymous album, whence I’d backtracked him to Hungry Chuck. It turned out that in an earlier life both Colegrove and Charles/Chuck drummer N.D. Smart II were founder members of Bo Grumpus, hence my initial interest in this album. Originally assembling in Boston as a funky jugband comprising Colegrove, Smart and guitarists Ed Mottau and Joe Hutchinson, Bo Grumpus mutated into a New York-based folk-rock outfit in the style of the Byrds and veered towards psychedelia at about the same time as their West Coast contemporaries. Indeed, Before The War has been compared to The Notorious Byrd Brothers, though IMHO it also owes a debt to Revolver-era Fabs. The harmony vocals are sometimes very Byrds-ish indeed, but at others very Beatle-ish, as are the keyboards and other esoteric instruments provided by their George Martin equivalent, the classically-trained Felix Pappalardi. The production by Pappalardi is also more sophisticated and glossy than anything the various homely McGuinn collectives ever laid down. Whatever, Before The War is a classy folk-rock-into-psych collection in its own right with carefully-constructed songs and excellent musicianship and vocals. For no obvious reason its original release on Atco in spring of 1968 tanked completely, and the album lay dormant until resuscitated by Wounded Bird for CD release forty years later. Meanwhile Bo Grumpus had moved to Bell Records with Pappalardi when he was headhunted by that imprint and recorded a further album Home under the changed name of Jolliver Arkansaw, again featuring Felix and also a guest appearance by his future colleague Leslie "Mountain" West. When this too bombed they called it a day late in ’69 and Colegrove and Smart subsequently joined Ian and Sylvia Tyson’s Great Speckled Bird. Today Before The War is readily available on CD or as an Atco vinyl re-release, but Home still awaits rediscovery and originals on vinyl will set you back a pretty penny. Despite the intricacy of much of the playing and production and the frequently mournful and introspective hippy-trippy lyrics, this album has a carefree, floating feel to it. Most of the tracks use the same gentle 4/4 rhythm and seem to flow into one another effortlessly; it almost feels like the whole album is one suite. Colegrove’s nimble flatpicked Gibson bass work is distinctive throughout; like Paul McCartney he was a lead guitarist turned bassist, which helps explain the nature of his playing, adventurous but never intrusive. Probably by comparison to their live sound, the guitars are mostly mixed well back but provide plenty of sonic variety, with fuzz, wah and electric 12-string all exercised. By the time recording had finished drummer Smart had left to be replaced by Ronnie Blake; their no-frills styles are pretty well indistinguishable. The polymath Pappalardi contributes various keys, trumpet, ocarina and glockenspiel. The opening "Sparrow Tune" sets the template, led out by a trademark Colegrove riff and coloured by fuzzed guitar and churchy organ backing. Also notable are the overtly psychedelic "Yesterday’s Streets" with its electronically treated vocals, baroque harpsichord trills and glock fills; the string-laden "Travelin’ In The Dark" which recalls early Moody Blues, and the unmistakeably Beatle-ish "The Moon Will Rise" with lush answer-back vocals and a sublime ocarina solo. The wry "Ragtimely Love" and "Brooklyn" are hangovers from the outfit’s jugband origins. ©2014, The Cool Groove, All Rights Reserved.